As Orel at Sons of Steve Garvey mentioned last night, the Dodger have organized an impromptu blogger get together at tonight's game against the Padres. Like the Sons I quickly RSVP'd without hesitation. It's not everyday you get a chance to see a game in a suite. On top of that, this will be a first for me at Dodger Stadium. I can't wait to don my Dodger jersey. I'll put my cap on my head as I head to the gates leading to the stadium. The ticket taker will greet me with a smile and repeat the words I've been longing to hear all year. "Welcome to Dodger Stadium." Yes! Tonight will be my first regular season game of the year and I can't wait. I'm coming from down south of the orange curtain. So, traffic will be a major issue for me. Hopefully, the great Dodger in the sky will part the lanes enough for us to squeeze through. Thank you to Chris at Dodgerfan.net for making the pitch to Josh. I look forward to meeting all of the folks who can attend. Remember that tall lanky kid that came around our parts with a golden arm. He was a shy guy who everyone believed had the ability to blow people away. 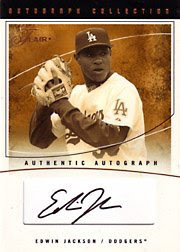 When Edwin Jackson came up with the Dodgers during the 2003 season many worried that he was being rushed. We ran the risk of hurting his fragile nature by throwing him at the wolves. After all, he was just 19 years old. How would he react to the daily grind of being a highly touted major league starting pitcher? As many of you remember, he started out with a bang. His first major league game was against future Hall of Famer Randy Johnson and the Arizona Diamondbacks. By the way, that game was on his 20th birthday. He won that game handily by going a solid 6 innings. He showed poise and consistency that made us all wonder, "do we have a bonafide number 1 pitcher here?" He finished the season strong going 2-1 with a 2.45 ERA in 4 starts. Not too bad for the rookie. Next year was going to be interesting. Unfortunately, this is where the story takes a detour. He began the 2004 and 2005 season in the minor leagues with the expectation of a late season call-up. Each time he came back to the big show he looked worse and worse. He had lost his confidence. He had lost his stuff. His respective ERA's those two seasons were 7.30 and 6.28. Management had lost all confidence that they could get him back on the right track. rebounded somewhat after the all-star break, posting a 4-6 record and a 4.48 ERA over 15 games. Maybe he was starting to figure it out. Maybe the damage done to his confidence in LA was disappearing. Maybe he can regain his status as a "can't miss" prospect. This season, 2008, Edwin Jackson is showing signs that he is coming into his own. In 2 starts this season he is 2 and 0 with a minuscule 0.64 ERA and his stuff has been filthy. The young kid who grew up in Dodger Blue may be turning into a monster of a man on the mound for the Devil Rays. He may very well be turning into that ace pitcher we all dreamed about. Only time will tell, of course, but I'm pulling for him. Sotheby's/ SCP has some great rare items in their upcoming auction. They have trophies (like NY's 1999 World Series Trophy) to signed Baseballs (Cy Young)(Ty Cobb)(Babe Ruth). Of course, nothing beats a letter from Baseball's meanest and most despised man, Ty Cobb. Check out his letter here. He writes about how "They Ruined Baseball." The below lot just leaves me breathless. 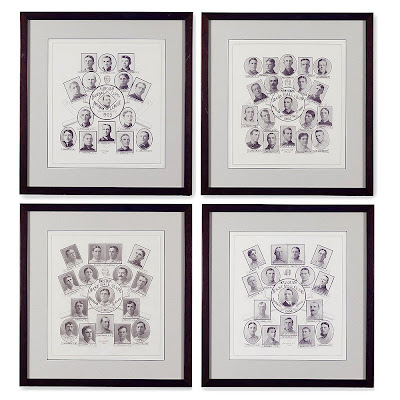 They are auctioning off a collection of 24 framed and matted Sporting Life Baseball team composite pictures from 1903 to 1908. They are in pristine condition and feature nearly every major Baseball star from the era. The Cooney family was an early Baseball dynasty. Johnny Cooney was the youngest of the "Cranston Cooneys," a Rhode Island ballplaying dynasty begun in the 1890s by James Joseph Cooney, whose four sons all played pro ball. Two brothers never got to the majors, but Johnny strung together 20 seasons in the big leagues that saw him adapt from a pitcher to a potent hitter and outstanding outfielder. His career was spent primarily with the Boston Braves and Brooklyn Dodgers, where he thrived under the tutelage of Casey Stengel. 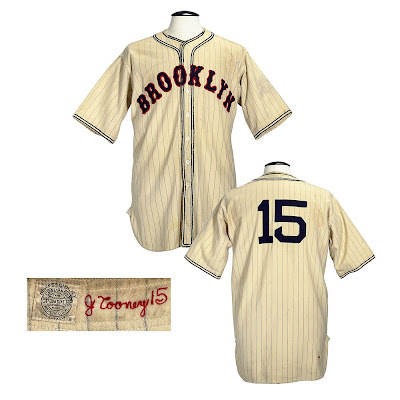 Below is his game worn Brooklyn Dodger home uniform from 1936 and is very rare. It is one of only two known (still existing) pinstripe Dodger jerseys from 1936. Gil Hodges was a fan favorite. From his early days as a Dodger player to his later career as manager, he always received the adoration of fans and players alike. The silver plate below was an early symbol of that popularity. 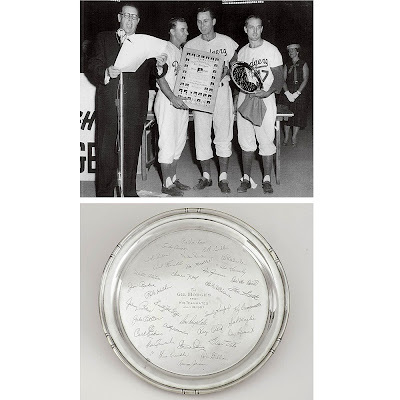 It was presented to him on July 19, 1957 by his fellow Dodger teammates as recognition as winner of "Player Popularity Award." On a side note, why isn't he in the Hall of Fame? His playing career and the World Championship with the Miracle Mets in 1969 should be more than enough. In his 16 seasons with the Dodgers, Hodges anchored the lineup during their Brooklyn heyday, hitting at least 30 home runs a season from 1950 to 1954. He knocked 100+ RBIs each year from 1949 to 1955 seasons. Known as the best defensive first baseman in baseball, the six-time All-Star also won Gold Glove for the first three years that they were awarded, 1957-59.